Innovation plays a key role in government transformations at all levels. In the federal government, for example, agencies have begun to designate chief technology officers, chief innovation officers, chief data officers, entrepreneurs-in-residence, and similar roles to promote new approaches to innovation. But because many innovations are rooted in the use of technology, agency Chief Information Officers (CIOs) can play a strong role as well. Furthermore, the new Federal Information Technology Acquisition Reform Act creates a statutory requirement for CIOs to help lead agency IT innovation efforts. For this report, Drs. Dawson and Denford interviewed nearly a dozen senior leaders, most of whom currently or recently served as Federal CIOs in a wide range of federal agencies. The report identifies how these leaders undertook technology innovation initiatives, such as moving agency operations to a cloud environment. 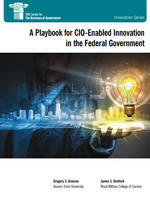 They also distilled a series of recommendations for fostering CIO-enabled innovation in other agencies. We hope this report serves as an inspiration to CIOs and innovators everywhere in government. Read the Federal Computer Week article on the report.